Danielle Kuhlmann is one of seven musicians who joined the Seattle Symphony at the beginning of the 2017–2018 season. 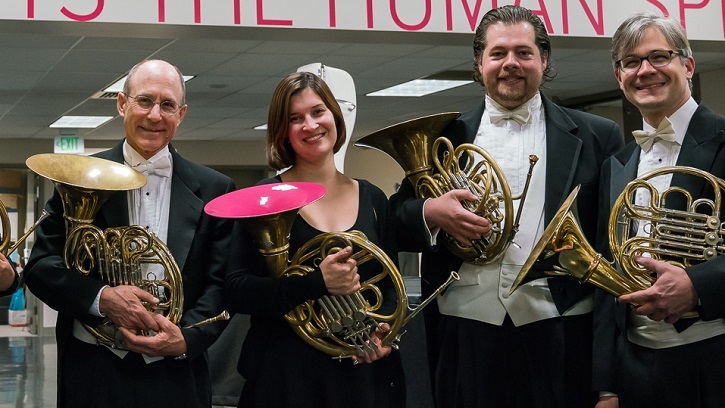 A Seattle native, Danielle is living her dream as a member of the horn section in her hometown orchestra. For Danielle, being a member of the orchestra goes beyond the stage. "It's really special here — the relationship that you're able to build with your audience, your donors, your subscribers. I think it's pretty unique to Seattle." Growing up in Seattle, Danielle attended Garfield High School, where she was inspired to pursue a career in music, in part, by her participation in Side-by-Side Concerts with the Seattle Symphony. "I'm really excited about the Side-by-Side Concerts," says Kuhlmann. "When I was at Garfield we did the Side-by-Side with the Seattle Symphony and now I'll be playing it again on the other side." "Realizing my own journey from those experiences — and maybe to be able to influence someone who's on their own path — it's a huge part of why I love being a musician. It's not just performing for people, but also being able to interact with people and share what I've learned." On January 5, 2018 the Seattle Symphony will perform a Side-by-Side Concert with Garfield High School at Benaroya Hall, where Danielle and her fellow Symphony musicians will once again have the opportunity to mentor and provide inspiration for a new generation of orchestra musicians. The performance is free and open to the public, but reservations are encouraged. Welcome to the Seattle Symphony, Danielle! Through the support of generous music lovers like you, the Seattle Symphony is able to make dreams come true for musicians like Danielle Kuhlmann. Join the community of supporters who make it possible for the Symphony to attract and retain world-class musicians, and to foster the next generation of orchestra musicians through Side-by-Side Concerts and other education programs with your donation today.